Obama heads to Ohio today. WASHINGTON (CNN) - President Barack Obama headed to Columbus, Ohio on Friday to attend a graduation ceremony for 25 police cadets. 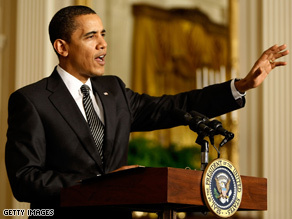 Obama has repeatedly pledged to save or create 3.5 million jobs with his economic stimulus plan. The soon-to-be graduates of the Columbus Division of Police were recently told they would be laid off due to budget cuts in the city - but the mayor of the city announced that with money from the economic stimulus package, the jobs would be safe through at least the end of the year, and the White House says those jobs were saved because of the president's economic stimulus plan. The presidential visit comes on the heels of the February jobs report, which reported 651,000 jobs had been lost. The unemployment rate now stands at 8.1 percent, its highest level since December 1983. The president and Attorney General Eric Holder are expected to speak to the graduation class mid-day Friday. Dont you DARE ask me to cooperate with this socialist, nay, communist, President we have. Kevin in Ohio, you are a GRADE 'A' FOOL. You spit on this country every time you make a post. and spout off like you actually know what you're talking about. so you don't come off like an idiot. Do you even have an area of expertise? Or is your are of expertise 'hunting and pecking' the word 'socialism'? You think you'd at least have a working definition of it by now. You are the poster child for why we need better education in the US. Between 8/28/08 AND 10/11/08 THE dOW LOST 27% OR 3,264 BUT NO ONE HAS MENTIONED THAT BECAUSE THE REPUBLICANS WERE IN CONTROL OF THE ECONOMY. EVERYONE BLAMES OBAMA. lets see if the mayor raises property taxes he can keep the cops. wonder if by next year all the underwater zealots that still haven't walked away will carry that load as well? this is what happens when government interferes with natural selection and bails out failures. I can't blame Obama he just got there and probably has no idea what earning a living is about, until now that is. He is getting sucked into the whirl chasing pixies. this situation will continue on the same path, after all if you do the same things expect the same results, lesson 1 from the real world. Still you guys are complaining. We are not actually in a recession, we are in a mild depression. jobs are lost and maybe not coming back. I worked in retail and think retail gets hits firstly. People don't spend, the retail workers loose their jobs. I felt that many times, I closed a store when I was 18. The price of struggling economy. Look at Wall Street and what they pay their CEO's and they did crap. It will take some time to get out of this mess. What is wrong with you CNN. I usually think you are less stupid than FAUX News, but lately I think you are on even ground. That is 25 more families who will be able to pay their mortgage. Progress is progress. Do you expect everyone to get their job back overnight? These attacks against Obama are completely unfounded. He is doing a good job. I don't think he can save this economy in a short amount of time, but what I do know is that our worst president ever, Ronald Reagan, had his theories and they did not work. There is a reason that there was a recession during his presidency. Reaganomics DON'T WORK. I think Obama's plan will pay off in the end, and the American people need to remember that it was the Republicans under that nimrod Bush who got us into this mess with their tax cuts for the super wealthy and their deregulation of corrupt and greedy corporations. The duty of this government is to main street, not wall street. I think Obama is headed in that direction and I am very glad to see it. If Obama is a joke then why is the GOP not laughing? Its because the GOP just does not get it. Get well soon. You can add my sons job as a special ed teacher to the number of jobs saved and also other teachers job but more important is these special needs kids get to keep their teachers and not go through the emotional tool that it surely would have had on them would they had lost a teacher who loves and cares about them. If you really want to know how much Obama cares about you look into those soulless eyes and you will see the black heart of the serpent that resides within. This guy and his cohorts are pure evil. The stimulus package has created more than 25 jobs already so far. Do you research at least before you put it out there. Is CNN the new Fox News? There are many jobless people out there who will be happy to do your job better for less. Is my comment waiting for moderation or censorship? It took the repugs 8 years to get to this point, but many people are expecting Obama to cure the economy in less than two months… wake up, it takes time for any policy to run its way into the dynamic system such as economics. Obama is trying to solve both short term and long term economics woes of the USA, but many don’t understand it. They want everything to be solved right away. This problem has years in the making, so get ready for a long rude and bumpy path to recovery. By the way headlines like this don’t help. The President will do it!!!!!!!!!!!!!!!!!!!!! Clearly, Obama needs to put more money into our educational system, as many of you are clearly just not bright. I mean, typos are one thing, but confusing there with their multiple times indicates to me that some on here are attempting to sound more intelligent than they really are. Does anyone else think that the President's goal of, "Creating or SAVING 3,000,000 jobs," is kind of a joke. I mean, honestly, all that has to happen is unemployment must stay under 98%. As long as 3,000,000 people in this country still have jobs, MISSION ACCOMPLISHED, Mr. President. Way to go. That's change I can believe in. Glenn Beck moved to Fox and doubled the number of his viewers. CNN is taking notice. I saw Anderson Cooper yesterday who without any proof said nobody wanted to work with Geithner. Incredible. If I want to listen to right wing nuts I will go on Fox. @ southerncousin, who said "Apparently there is no confidence in what he says." Actually, there is for the majority of us. Economists have all been saying that no matter what we did, the market was going to continue to slide for a while before it turned back up. When it does turn back up...and it will...will you be claiming that it was all Obama's fault then? Of course not. You'll fabricate some theory as to why it had nothing to do with Obama and his plans because the fact that his policies worked and were not the disproven, trickle down, tax cuts ideology revered by the GOP "does not compute" for you. So you'll rationalize some X-Files style nonsense about how it actually all fits with your ideology even though right now you're screaming that it's all as far away from your ideology as humanly possible. The most transparent thing in DC is the GOP's predictable political games. Laura in Boston, Bush cut taxes and the economy was still sound because he had a nice surplus to work with. That was till he had two wars to deal with. And yes, the market was tanking well before this year. That would be W's economy. You people are morons, plain and simple. Clearly the people here posting negative comments have no idea of how bad things really are and far back this goes. For the 1000th time morons this did not start with Obama. Geez! The token one, Pelosi, Reid, Dodd,Biden,Franken et al are doing a fantastic job ensuring the demise of the Democratic Party as we know it. Watch what happens 4 yrs from now. I hope we're not all broke by then.